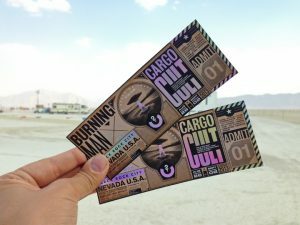 ​Burning Man is a celebration of human ingenuity and a spectacle of self-reliance and self-expression. But no matter what wonders of humanity emerge in the Black Rock Desert in Nevada each August, Mother Nature’s creations are always more impressive: searing heat, high winds, torrential rains, freezing temperatures, and dust storms galore – and that’s just Monday! In a festival of radical wonders, the weather can be the most extreme thing you will experience at Burning Man. So when it comes to setting up camp, you need to be prepared for anything and everything – especially at night. If you are pitching a tent, you will need one that is durable, weather-proof, and comfortable. I took this on my first burn and felt like I was living in luxury. This spacious 6-person tent provides 6 and a half feet of ceiling height, mesh windows, and vents for managing temperature. The 100% cotton canvas shield is a throwback to classic designs and is highly durable and watertight while also being breathable. The Coleman Sundome 4, 9’x7′, dome tent is part of the classic Sundome series of tents from Coleman. The Sundome 4 sleeps 4 happy campers and includes a large door for easy entry/exit with a hooded fly to provide ventilation even in rain. A large rear hooded window also provides airflow for cross ventilation. Mesh vents on the roof provide additional ventilation and the rugged 1000D polyethylene floor is a bathtub style (wraps up the sides) for extreme weather protection and has welded seams, even in the corners, to guard against a leaky floor. The Bunker is highly water resistant, and the pre-attached poles make it very stable as well as quick to set up. It sits low to the ground which makes it stable in the wind, and with room for a queen-sized air mattress, this bunker is built to share. 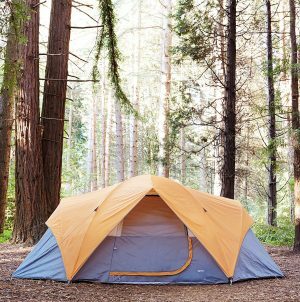 Constructed of durable but lightweight nylon, the Fury is designed for year round camping and features 36 square-feet of floor area and a 9 square entry vestibule that provides a perfect weather break. 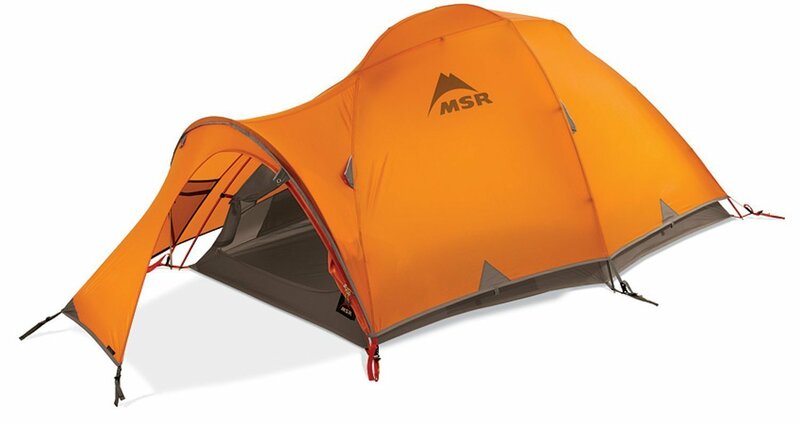 Its small footprint and low profile make it stable, and MSR’s reputation for great customer service and a lifetime warranty make it a sound investment. This lightweight, three-person tent is designed for serious expeditions and can handle temperatures as low as -60 Fahrenheit. The glow-in-the-dark zipper comes in really handy and provides a nice splash of Burning Man style. 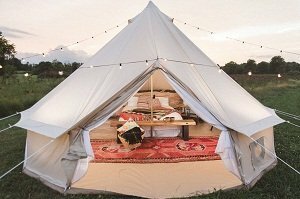 For space and style in a surprisingly tough design, this cotton canvas yurt is a popular choice among burners. The floor is made of plumbing-grade PVC for when things are wet, and when the weather is nice the sidewalls can be rolled up for a canopy-like feel. The rigid center pole and plentiful guy lines (the ropes that tie to the stakes) provide high stability. Room for 8 and a solid, durable design that performs in all kinds of weather have earned Big Agnes lots of big fans. The fabric interior wall can sub-divide the space so you have two rooms. The unique pole structure makes this one of the roomiest, high-performance tents available. High quality water-resistant material and taped seams mean there is no need for a separate rain flap. An integrated, heavy-duty zippable groundsheet allowing you to roll the sides of the walls up on a hot summer’s day and to let the wind pass underneath. There is also a stove hole on the sidewall so you could place a camping stove to keep warm on the winter season. With plenty of room for the whole family or a group of friends, this large AmazonBasics tent offers enough space to comfortably accommodate up to eight campers. It will even hold cots or air mattresses for a more comfortable night’s sleep. The family-size tent measures 15 x 9 feet with a 6-foot center height for room to stand and move around.